I was just messing around Earth and was looking at the WTC. Then I was looking at the previous image capture dates. It actually has an image captured of the WTC on 9-11-2001 just after the attack. I wonder if this was a coincidence or if NASA made the satellite take pictures at that moment. Its Google Earth satellite images. There is no direct link to the images. You need to download google earth and navigate to the location. Then click the little clock in the bottom left of the image to see earlier image dates. 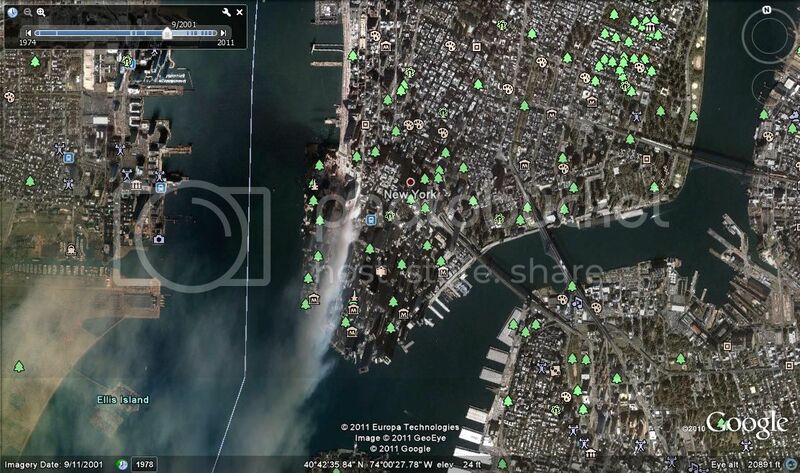 Here is the image I copied from google earth. If I remember right google did that. They ordered a satellite flyover. I thought Google owned the satellite that makes the Earth images. Noticed in the left-hand corner a slider parked on a 9/2001 image. I presume images for other years are available? Yes, there are images going back to the 70's. Of course they get grainy as they get older. Google really good in helping human being!